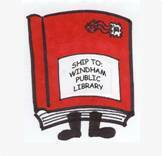 The Special Request Service (formerly Interlibrary Loan) allows patrons of the Windham Public Library to borrow items for FREE from lending libraries outside of the statewide system. We’ve received items from as far as away as Hawaii and Canada! You can fill email it (include your name, your library card #, and information about desired item), call it in (207-892-1908), or fill out a form in the library. Items generally take 2-4 weeks to arrive. It depends on how promptly a library offers to lend the item and how quickly they mail it to us. The service is free, but we do pay for postage so contact us promptly if you need to cancel a request. You can request audios, music, movies, foreign language books, and large print books. You can request magazine/journal articles. Depending on the lending library and the number of pages requested, there may be a photocopy fee. You will be notified when the item arrives, or if the request fails. All items circulate for 3 weeks. Renewals may be allowed but only upon the lending library’s approval; contact Sally (207-892-1908) promptly so she can make the request.